An IPS officer on the release of an offender from detention was reportedly caught cheating in UPSC mains examination at the Presidency Girls Higher Secondary School in Chennai on Monday. Safeer Karim was intercept using a Bluetooth device to speak to his wife, who states the answers, according to police. He is a resident of Kerala, has been taken into custody and charged under Section 420 of the IPC. Since his wife is in Hyderabad, a senior police officer said they have sought the help of their counterparts in Hyderabad to take her into custody. “A team of officers from Chennai will go to Hyderabad soon,” said the officer. 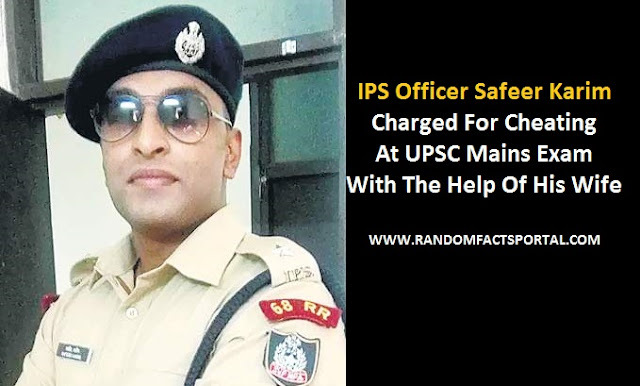 A 2014-batch IPS officer, Karim was on probation, serving as the Assistant Superintendent of Police in Nanguneri sub-division, a taluk headquarters in Tirunelveli district. Earlier, he founded a coaching centre for the civil services exam, called Karim’s La Excellence, with branches in Thiruvananthapuram, Kochi, Calicut, Bhopal and Hyderabad. The coaching centre’s advertisements say Karim is an IPS topper (112th rank in 2014). Comparing the civil services exam with a video game, Karim, in an interview to a leading Malayalam daily in 2015, was quoted as saying that it was actor Suresh Gopi, now a BJP member of the Rajya Sabha, who inspired him to become an IPS officer. Gopi is known for his heroic police officer roles in Malayalam films. Karim later also met Gopi. An advertisement put out by his coaching centre last year talks of a 15-day residential programme for a batch of 20 students. “Optional Sociology for Mains 2016 by Safeer Karim, IPS (Sociology topper, 112th Rank, 2014),” it says. “All your teachers under one roof. Kerala’s No. 1 IAS coaching centre founded by Safeer Karim, IPS,” says another advertisement. Official sources said Karim may face disciplinary action, including dismissal from service, as he was still on probation.